So let’s say you have a Microsoft Access Database file, which you need to have 5 employees working on, at the same time. A great way to achieve it, is by creating a network drive, or in my case – shared folder. In our office, we use Microsoft Access to manage our PO (purchase orders) system. We have 5 employees putting data in. The file itself is located on a “server” which is basically a local machine with Windows 7 premium installed. It has a shared folder, and they all work on this Microsoft Access Database (using Access “shared” open mode). The problem here, is that the user is trying to open a file which is not located on the local drive. 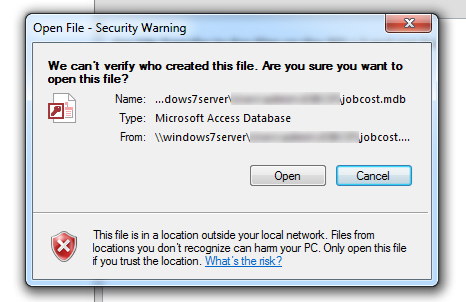 Windows thinks that the file is not safe (an intranet location) and tries to block it. 1. Open Control Panel, and go to “Internet Options”. 2. Click on the “Security” tab. 3. 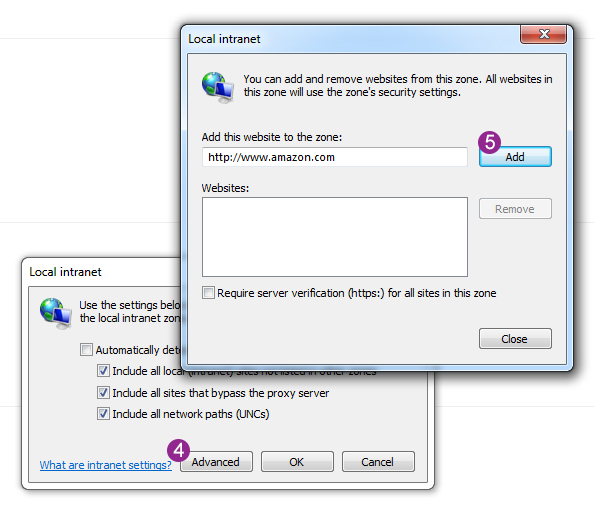 Click on “Local Intranet”. 7. Type in the shared folder address where the file is, for example \\home-pc\users\admin\documents\. 9. Click “Close” and then “OK”. 10. Try to open the file again, and you will be rid of the security warning. Why does Access look at IE settings?